New research suggests that the asteroid Vesta could host ice beneath its surface. Large smooth patches of terrain suggest that impacts could have brought up buried ice that melted, flattening the surface. Vesta is the second-largest asteroid in the solar system, a 330-mile-wide (530 kilometer) titan in the asteroid belt between Mars and Jupiter that is sometimes visible to the naked eye on Earth. The only larger asteroid is Ceres, which is also classified as a dwarf planet. Among the findings was evidence that Vesta has an onion-like structure like Earth's, split into an outer crust, a central core and a mantle layer between the two, and signs that Vesta once had a magnetic field. According to the new study's researchers, previous work suspected that any roughness in Vesta's surface was largely due to cratering from the occasional impact with other asteroids. However, new data from Dawn now suggest that some of this variation may be due to ice buried under Vesta's surface. The researchers analyzed large smooth patches of terrain on Vesta. They found these patches frequently possessed high concentrations of hydrogen, which is often seen when solar radiation breaks down water molecules. "We suggest that modifications of the surface by melting of buried ice could be responsible for smoothing those areas," said study co-author Essam Heggy, a planetary scientist at the University of Southern California in Los Angeles. "Buried ice could have been brought to the surface after an impact, which caused heated ice to melt and travel up through the fractures to the surface." The researchers noted that other data from Dawn suggested that ice might exist on Vesta. For example, a 2015 study identified gullies on the asteroid potentially carved by short-lived flows of water on Vesta's surface. "It is surprising to see more evidence of ground ice on Vesta," Heggy told Space.com. "Vesta was expected to be a desiccated body." 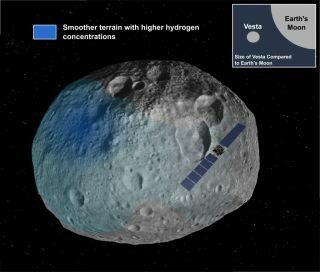 These findings suggest that ice could be present at larger scales "and could have played a more significant role in the evolution of Vesta than previously thought," Heggy said. The scientists would like to analyze Ceres for similar findings. Learning more about the presence of ice on asteroids is "of major importance to understanding the transport and evolution of water-rich materials in our solar system," Heggy said. The scientists detailed their findings online Sept. 12 in the journal Nature Communications.